Compiling a striking presentation? A memorable photo album? An impeccable portfolio? Or... just showing off? Then this extension is just what you need! Presenting information is very much like serving food - you do not serve a sirloin steak on a mouse pad. Likewise, the 2D computer screen is not the perfect plate for serving websites that appear as flat images - slideshows are best, but they seldom give the familiar feel of a magazine or book. If you prefer websites served a la livre, try FlippingBook Joomla! Extension to turn your web page into a 3D folio that looks just as good as it reads. The administrative part of the extension lets you create books in a matter of minutes - no programming or design skills required. All you need to do is load the image files, create a new book and assign page numbers to the files. The administrative interface is simple and intuitive meaning you do not need any prior experience with Joomla! Extension to install and set it up. 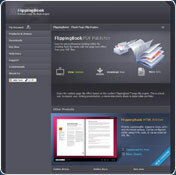 FlippingBook Joomla! Extension can be used to create a series of books and bind each one to a menu item. The extension has a variety of settings to allow the virtually unlimited personalization of your books, for example by selecting your own background, changing shadow parameters, adding flipping sounds, setting animation speeds, and many other parameters. The default settings offer an ideal balance and would suit most projects. The extension is supplied with several personalization themes. You may choose any of them or retain the default style - whatever works best for your website. Web designers will appreciate the single css file containing all of the styles for them to play with! You cannot download any crack or serial number for FlippingBook joomla extension on this page. Every software that you are able to download on our site is legal. There is no crack, serial number, hack or activation key for FlippingBook joomla extension present here. Our collection also doesn't contain any keygens, because keygen programs are being used in illegal ways which we do not support. All software that you can find here is freely downloadable and legal. FlippingBook joomla extension installation package is prepared to be downloaded from our fast download servers. It is checked for possible viruses and is proven to be 100% clean and safe. Various leading antiviruses have been used to test FlippingBook joomla extension, if it contains any viruses. No infections have been found and downloading FlippingBook joomla extension is completelly problem free because of that reason. Our experts on malware detection tested FlippingBook joomla extension with various spyware and malware detection programs, including fyxm.net custom malware and spyware detection, and absolutelly no malware or spyware was found in FlippingBook joomla extension. All software that you can find on our servers, including FlippingBook joomla extension, is either freeware, shareware or open-source, some of the software packages are demo, trial or patch versions and if possible (public domain licence), we also host official full versions of software. Because we want to be one of the fastest download sites on the web, we host all the software including FlippingBook joomla extension on our servers. You cannot find here any torrents or download links that would lead you to dangerous sites. Rate FlippingBook joomla extension 1.0!